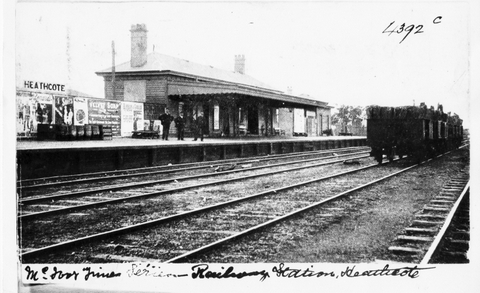 The Friends of the Bendigo-Kilmore Rail Trail group are desperately seeking items of local history, individual’s reflections, photos, memorabilia, oral history, anything related to the former Wandong, Heathcote, Sandhurst Railway (Wallan to Bendigo). History related to the building of Lake Eppalock (that caused the closure of the Heathcote to Bendigo section of the line in 1958), ‘Stranger Rock’, transporting cut timber from local sawmills at the Heathcote, Derrinal, and Knowsley Stations, VR employees, all could be triggers for ‘living the history’ that are placed at certain locations along the new O’Keefe Rail Trail. From such, it is hoped that interesting and informative interpretive boards can be created and placed along the O’Keefe Rail Trail, perhaps at former station sites like Axedale, Axedale Racecourse, Derrinal, Knowsley, Heathcote, Longlea, Strathfieldsaye, Rangelea, Rifle Butts, and even at the North Bendigo Workshops (which had nearly 700 employees at one stage!). Such items will be a way of informing future generations about this lost transport route, as well as something to excite the history seekers! If you haven’t already I would suggest asking at the Bendigo Library to see what they may have in their local history collection. Thanks Matt for that suggestion. Have you the opportunity to spend just a small amount of your time to check that out at the Bendigo Library, to assist the Friends with their many efforts?